I like to think that I am in control of my sweet cravings as I normally go for more savory options but there is one thing I can’t resist and it’s a cupcake. I am the ultimate cupcake fanatic. I love trying different designs, different flavors and coming up with new combinations each time I make them. It’s the one thing I can’t say no to when they are in the house. Funny story is I have never liked birthday cake so what’s in a cupcake that’s so different? I am not sure but something about a tiny cup seems to be more moist and full of more flavor then a large cake. I have been making various kinds of cupcakes these past few weeks for those that have seen on my facebook page, I’m testing out some new designs as much as flavors, trying to perfect my piping skills. Through this process I think I have even perfected my buttercream frosting recipe too. So I took it a step further and started adding things to my basic buttercream recipe which I will be sharing soon too. 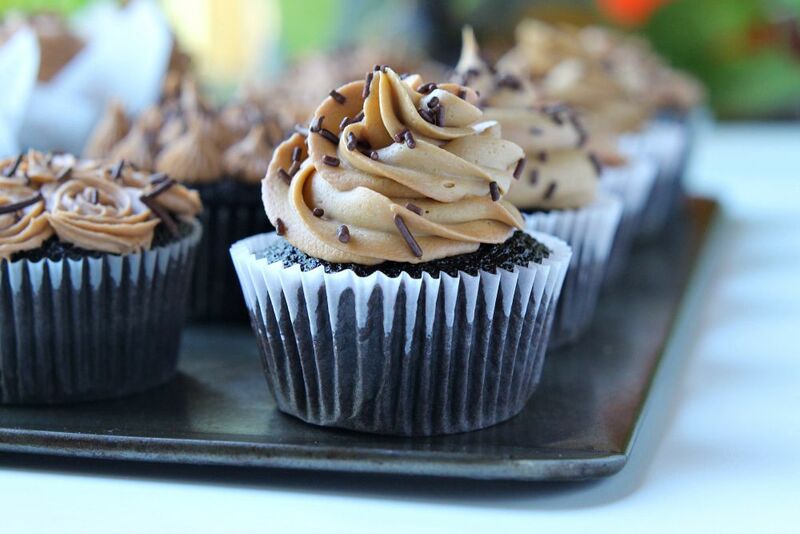 Today, I am sharing how great my almond chocolate buttercream frosting came out and pairing it on top of dark chocolate cupcakes. 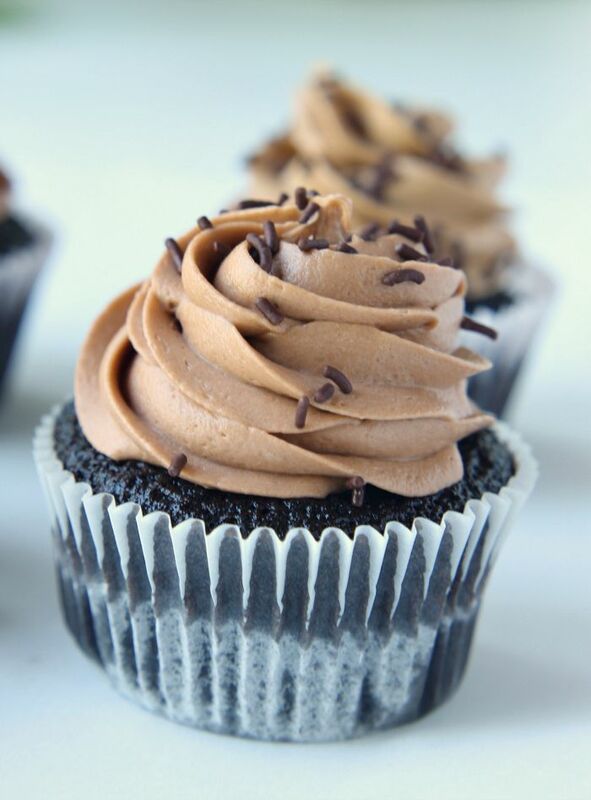 For the perfect vanilla buttercream frosting, substitute almond extract for vanilla extract and don't add Hershey's melted chocolate in. Want to give this recipe a try later, why not pin this pinnable photo below so you can refer to it when you have the time. It’s a perfect one to save for a child’s next birthday party or hosting a party for adults. Cupcakes have no age limitations. If you give it a try, let me know and tweet me a photo or tag me on instagram, I would love to see your creations. That’s why they are all so different I was practicing which piping designs I like best but it turns out I prefer them all different, makes it feel like you are picking out a special one every time. MM did take forever to choose but sadly B can’t eat cake due to allergies and actually hates sweet things so I am lucky more for MM and Mommy. lol Thank you so much. Try them out so easy to make. Oh my GOD, yes. These look literally amazing. They taste even better than they look too. I promise. Try them out and let me know what you think, or pin them for later. Thanks Amber. Thanks Amelia, they are so easy to make and really yummy. This batter is so thin I don’t think you will have a problem keeping them airy. While baking watch them closely and don’t over bake them, you can do a little under baked and leave them in the hot pan to finish baking outside the oven. Don’t turn oven on too hot and cook just until the top bounces back up when pressed in. Also I find american flour does make cupcakes here a little more fluffy. Not sure why. But this recipe should be easy to keep airy and fluffy. Let me know how you get on. Oh my word, Jenny, you’ve surpassed yourself with these. They look amazing and your piping is awesome. I can bake but I cannot pipe to save my life. I need a lesson from you! They look absolutely mouthwatering and gorgeous. 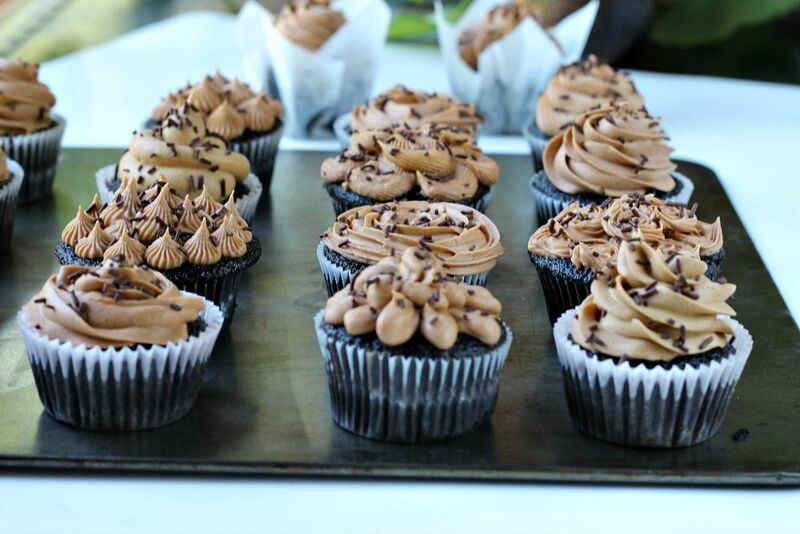 I think I’d love to lick the icing off, which Zs way of eating every single cupcake ever! Those look lovely. 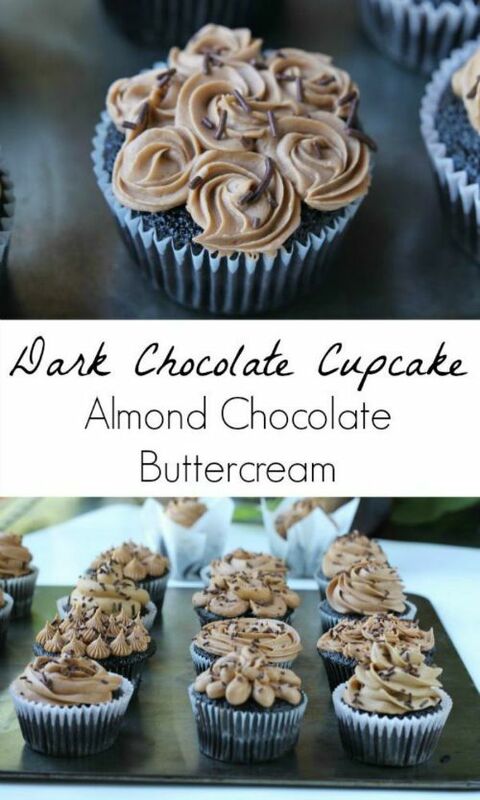 I was literally just thinking about making some chocolate cupcakes, must try these. Thank you I have been practicing all summer with the piping have a lot more to learn and practice with them. I need more tips too. 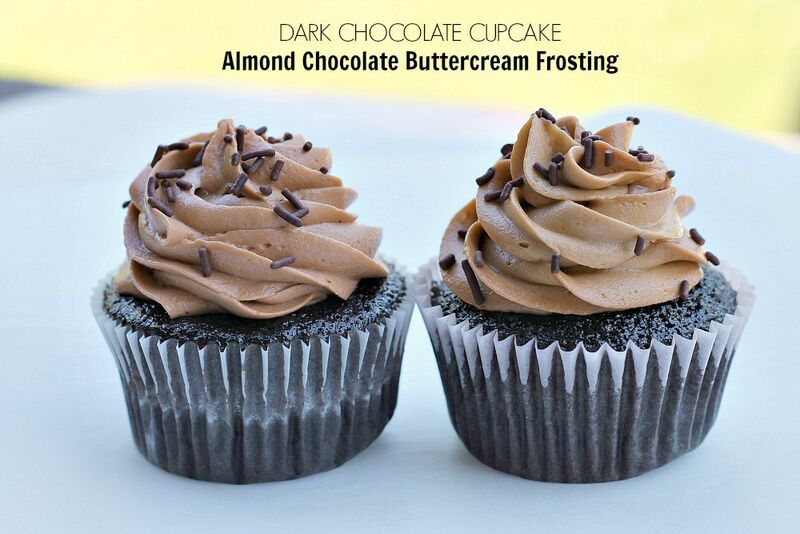 lol These are my new favorite flavor of cupcakes so far.